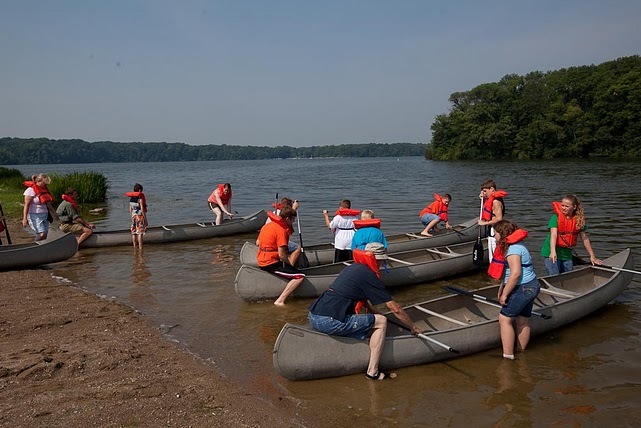 Wednesday, July 10, Cowan Lake State Park Naturalist, Erin Shaw and No Child Left Indoors volunteers will lead FREE guided canoe tours of Cowan Lake to explore the beautiful Lotus Cove area of the park. Canoes and lifejackets will be provided. This activity is geared toward children ages 5-14 and will focus on safety and proper paddling techniques. And as an added bonus, kids can participate in a "Turtle Census". To census turtle populations it is not simply a matter of knocking on log and asking how many reside in this cove. Volunteers Rick Kneisel and Jim O'Boyle will show how we use various (non-harmful) traps to census turtle populations in Cowan Lake and give us an opportunity to meet some of our local turtles up close. We will meet at Cowan Lake's Campground, parking lot "B". The campground is located at 1750 Osborn Road. A volunteer at the new Nature Center (old campground office) will direct you to our starting point. We will do a 10:00 a.m. and 11:30 a.m. paddling session. Families are encouraged to bring a lunch and afterwards enjoy one of Clinton County's natural treasures. This program is FREE, but space is limited. Register HERE and be sure to note which session you plan to attend. If you register and then determine you are not able to attend, please send an email to lkwilliams@gmail.com. That way we can make sure folks on the waiting list can be accommodated.